On the second day of Christmas, my true love gave to me- a new blog post on marine debris! Though the author is back in her native Wyoming for the holidays, visions of tsunami debris still dance in her head. Indeed, the issue of debris has been prevalent in many peoples' minds as NOAA models predict the bulk of items will be hitting shores in the coming months. The Japanese government has approved their proposed $5 million contribution to debris cleanup, far overshadowing the US's own contribution of $150,000 split between Washington, Oregon, and California. Volunteers are gearing up to continue and ramp up beach cleanup efforts, and beachcombers who would otherwise have walked past garbage are beginning to look more closely at items that have found themselves onto local beaches. Indeed, the oncoming debris promises many interesting items, and there has even been conjecture that large numbers of those highly desirable glass fishing floats could wash ashore. Glass fishing floats were originally manufactured in Scandinavia, but beginning in the early 1900's Japan began to produce them in large numbers. 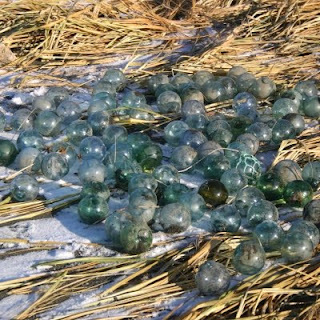 These nondescript glass balls came in a variety of sizes and were used as an inexpensive way (green floats were usually made from recycled sake bottles!) to keep fishing nets afloat. They sometimes would be dumped from vessels or escape their prescribed duties and find their way across the Pacific ocean. When washed up on shore, they became a beachcomber's ultimate treasure. While most floats are green, there are also purple, yellow, blue, and orange floats which were mostly manufactured in the 1920's. China also created their own glass floats, which are generally larger than Japanese floats, and often molded rather than blown. They have a tell-tale seam running through them. Production of glass floats has all but halted, in lieu of Styrofoam (a biologist's worst enemy), aluminum, and cork. Due to the large numbers originally manufactured, these treasures are still being found. Skilled beachcombers have secret locations where they may find hundreds at a time. Some believe that after glass floats fell into disuse, many certainly found their way into storage facilities that were washed away along the Japanese coast, and these may be bobbing their way over with the rest of the tsunami debris. It's unclear whether this is likely- much of the debris sank after the tsunami, and the idea of hundreds of thousands of glass floats sitting in derelict outbuildings is probably just wishful thinking- but a girl can dream. On December 19, 2012, it was reported that a large object spotted floating off the Washington coast had washed up near Forks, Washington in the Olympic Coast National Marine Sanctuary. Further examination confirmed that it was a large dock, and it had landed in a particularly rugged section of the national park's 70 miles of shoreline. Crews planned to travel along isolated trails to the dock in order to examine the dock for any potentially invasive species, put a tracking tag on it, and begin to develop a retrieval plan for the item. However, winter storms prevented the crew from doing this, and a second effort was made on December 21nd to reach the dock. Unlike the unfortunately 'lost' dock in Hawaii (which authorities failed to tag, and then disappeared after initial sightings), the debris team was able to put a tracking beacon on the object, which will aid in its recovery if it washes offshore once again. If you happen to sight any significant tsunami debris, contact DisasterDebris@noaa.gov. Click here for a short video of the dock by the Washington Marine Debris Team. Visit the Marine Debris Flickr page for photos of debris thus far.